Cancer hazard rates reveal more about cancer biology than any other statistical function. Hazard rate in breast cancer proceed through three phases. Following diagnosis and treatment hazard rate rises (AB). 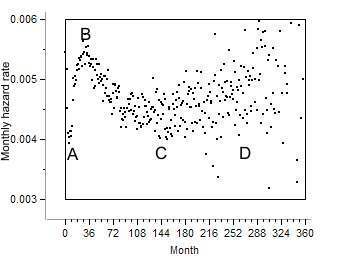 By the third year it reaches its maximum whereupon it declines to a minimum (BC). from there and on it gradually rises to a second maximum whereupon the patient dies (CD). This pattern is known as bi-modal hazard (BMH). It is unique to cancer and does not appear in other chronic diseases. It is an epidemiological hallmark of cancer. It is so typical of cancer that it distinguishes cancer from other chronic diseases. Data source: Surveillance, Epidemiology, and End Results (SEER) Program (www.seer.cancer.gov) SEER*Stat Database: Incidence - SEER 9 Regs Public-Use, Nov 2004 Sub (1973-2002), National Cancer Institute, DCCPS, Surveillance Research Program, Cancer Statistics Branch, released April 2005, based on the November 2004 submission. Cancer proceeds through two phases, compensated, when the tumor does not cause any damage or distress, and de-compensated, when the patient suffers. The first peak and trough (ABC) occur during compensation. The ascending part (D) accompanies de compensation which ends in death. It is the probability of a patient with breast cancer to die, and is affected also by other ailments the patient may have. 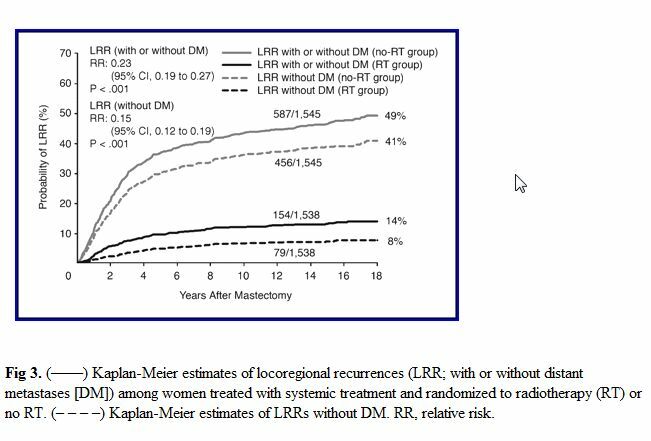 The relapse rate following breast cancer surgery is bi-modal. (Retsky et al.(2)). Mammography paradox: The hazard following mammography of young females is higher than in controls Cox (4). Hazard rate of recurrence of breast cancer in 3811 spanish patients. The improving conditional survival is associated with segment BC of BMH. We ought to distinguish between primary hazard or hazard[death] which accounts for death, depicted in the first curve and secondary hazards: hazard[recurrence], and hazard[incidence], which depend on tumor detection and not on death. Survival and conditional survival may be derived directly from hazard[death]. In order to derive secondary hazard from primary we need additional information: tumor growth rate and the resolution power of tumor detecting tools. 1. AB segment: Hazard rises due to treatment. The descending portion of BMH appears in all cancers and does not appear in other chronic diseases. 3. CD segment: Marks the final decline when resources are depleted and illness overpowers the patient. These observations convinced me to propose the following hypothesis. Cancer is a metabolic deficiency caused by a deficiency of a yet unknown metabolite A. In order to replenish the missing metabolite the organism grows a tumor which produces a substitute B. Since the deficiency continually aggravates, the tumor has to grow more and more in order to replenish the missing metabolite. In advanced deficiency tumor destroys vital functions and finally kills the patient. Tumor ablation aggravates the deficiency and the hazard rises. Patients with micro metastases are protected from therapy induced total ablation and their hazard rate declines. Clinically this deficiency is manifested by a wasting disease which starts with weight loss and gradually turns into overt cachexia It is named here pernicious cachexia. The tumor protects against cachexia. Treatment objectives: Do not treat unless the tumor causes pain and distress or destroys vital functions. Wait as long as cancer is compensated and treat only during de compensation. J. National Cancer Institute, (1999) 91 : 80-85. 3. 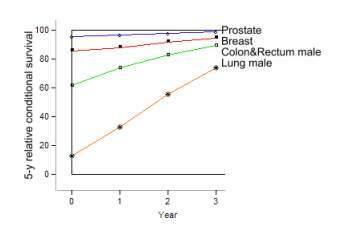 Saphner T, Tormey DC, Gray R. Annual hazard rates of recurrence for breast cancer after primary therapy J Clin Oncol 1996; 14: 2738-2746. Clinical Progression of Breast Cancer Malignant Behavior: What to Expect and When to Expect it. 7. GARY M. FREEDMAN, M.D., PENNY R. ANDERSON, M.D., ALEXANDRA L. HANLON, M.S., PH.D.,DEBRA F. EISENBERG, M.S., AND NICOS NICOLAOU, M.D.